Hāfez (1325 –1389) Persian Mystical Poet. “That Beloved has gone completely Wild – He has poured Himself into me! Hafiz was born in the beautiful city of Shiraz in Persia (now Iran ). As a young child he was called Shams ‘ud-din Mohammed. 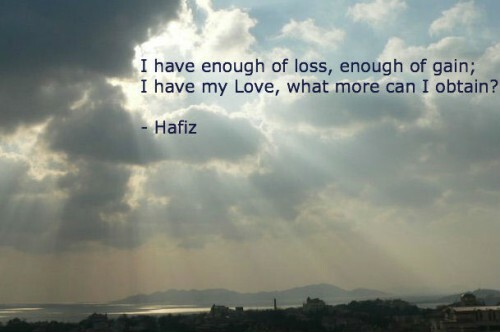 Hafiz proved to have a prodigious talent for literature. At an early age he successfully memorized the Qu’ran, and this is why he took the pen name of ‘Hafiz’ ‘ Hafiz means one who has memorized the entire Qu’ran by heart. As well as studying the Qu’ran Hafiz was also introduced to the other great Sufi poets such as Rumi, Farid ‘ud-din Attar and Saadi, these Sufi poets would later have some influence on the poetry of Hafiz. A famous story about Hafiz tells how he fell in love with a beautiful woman. He saw her in his local area whilst delivering bread. He became so enchanted with love for this woman that he could think of nothing else. Hafiz started to write love poems dedicated to his sweetheart, and these became famous throughout Shiraz. Unable to live without his beloved, Hafiz resolved to undertake a 40 night vigil at the tomb of Baba Kuhi’. Babu Kuhi was a famous poet who promised to fulfil 3 desires of anyone who could stay awake for 40 nights at his tomb. On the first night Hafiz had a vision of the Angel Gabriel. He was so enchanted with her beauty, he resolved to seek only God who would by nature be infinitely more beautiful than any human form. Gabriel then revealed to him where he could find a spiritual master who would be able to lead him towards God. This master was Muhammed Attar, who lived a humble life in Shiraz. From this point Hafiz became a prodigious poet producing hundreds of poems which expressed a seekers longing for union with the divine. His poetry made Hafiz famous and he gained the respect and love of many local inhabitants. However his ecstatic and unorthodox poetry gained him the displeasure of the ruling Muslim orthodoxy. Because of this Hafiz twice had to flea the city of Shiraz, on many occasions he was only saved by his sharp wit. 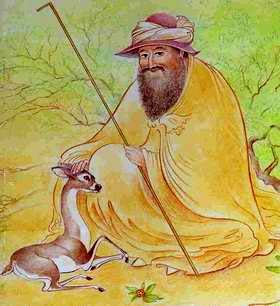 At the age of about 60, his Master Attar, finally granted Hafiz his life long desire – union with God. From this point Hafiz’s poems reflected a new consciousness, no longer was there any sense of separateness from God.